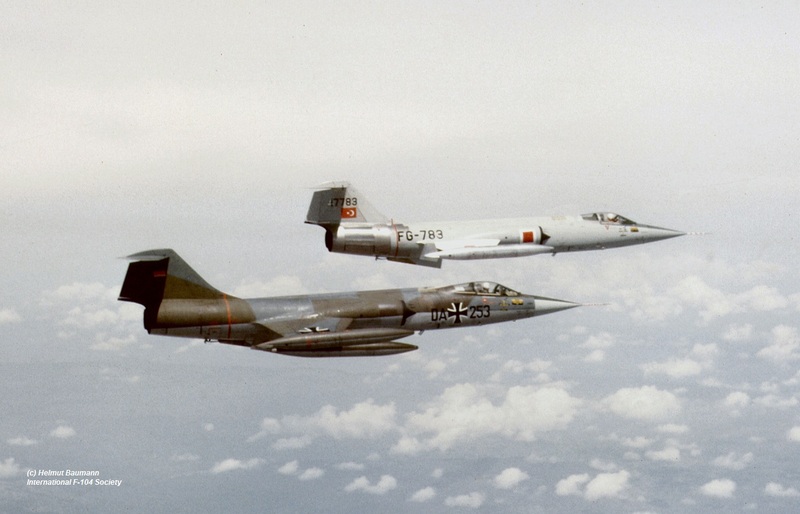 German Air Force JBG31 (1st Staffel) flying the F-104G, based at Norvenich, exchanged with the Turkish Air Force 141 Filo at Murted also flying the F-104G Starfighter. 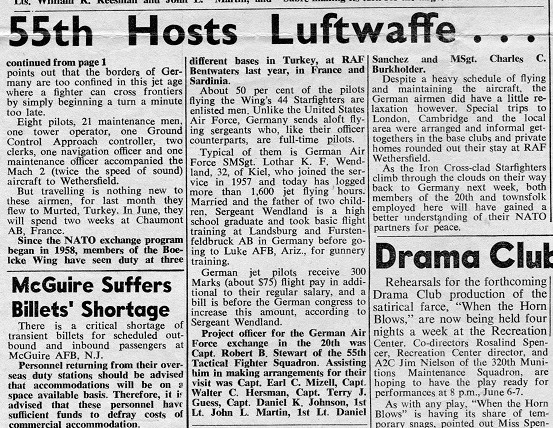 The Germans flew over to Turkey with four Starfighters and 25 technicians. It was a one-way exchange. Hptm Schenk coordinated this event. Photo beneath was taken at Murted (JBG31 photo). One of the aircraft seen at Murted was also DA+253 (cn 9175) seen beneath flying with a Turkish colleague over the Turkish landscape. (Thanks to Helmut Baumann). Arne Pedersen stated in 2011: "When looking in the IFS sqn. exchanges section in the period 1966-1970 I noticed a small picture of of a TF-104G just prior to touch down at Volkel Air Base on April 22nd 1966. Memories flushed through my mind like a huge waterfall, when it dawned upon me that this was a picture of me landing the TF, after a most memorable flight. The background was a NATO F104G Standardization meeting at RCAC Sollingen april 20th and 21st , which I took part in, and also a sqn.exchange with 311 sqn. a couple of weeks later. 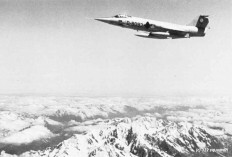 To get to the meeting I departed Bodø for Rygge Air Base on the 19th.On the way down we properly slaughtered 2 x F5s sent up from Rygge Air Base to intercept us, simply by utilizing the F-104 to its best advantage, speed and altitude. It was not easy to beat a 104 charging along at Mach 1.9! At Rygge I picked up Maj. Eyvind Schibbye, the first F104 squadron commander in the RNorAF, at that time a staff officer. We departed Rygge for RCAF Sollingen, where we resisted the temptation to ask for a visual approach, which was just as well. 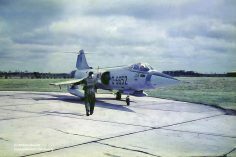 Previous experience with the dreadful European smog, had given me a lesson to remember a few years earlier flying the RF-84F Thunderflash. The meeting at RCAF Sollingen was a very interesting one. Our Canadian friends and other NATO partners, lectured us on the importance of operational standardization and on how to produce radar predictions. As I was lucky to be trained in the RCAF, I also had a reunion with quite a few of my old Canadian friends. As I was to command the sqn. exchange at Volkel Air Base in May, we decided to return via Volkel on april 22nd to have a look at the localities there. We flew low level from Sollingen in the most wonderful spring weather you could imagine. After a splendid lunch at Volkel, we proceeded back to Rygge Air Base, where Maj. Schibbye climbed out of the “TF”. He was replaced by Ltn. Per Kristiansen in the back seat, and we now proceeded back to the cold high north and our home base at Bodø. There we continued to play our cards, in the game called the “cold war”. 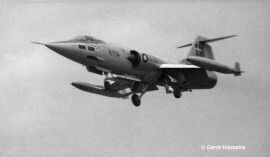 I returned to Volkel on may 4th via Aalborg Air Base with 4 F-104Gs. To get the most out of our flight, we flew low level all the way, which was a bit unusual. After a very successful sqn. Exchange we flew back to Bodo on May the 12th. This time we flew 2 hours and 15 min. flight directly from Volkel to Bodø. Both flights, to and from Volkel, demonstrated the versatility and the superb performance and characteristics of this beautiful fighter aircraft, which I felt extremely lucky to fly during an interesting and rather busy period of my life"
German Air Force JBG31 (2nd Staffel) flying the F-104G, based at Norvenich, exchanged with the USAFE 55 TFS/20 TFW stationed at Wethersfield, UK, flying North America F-100D Super Sabre. It was a shifted two-way exchange. The Super Sabres were present at Norvenich from 13 till 17 April. 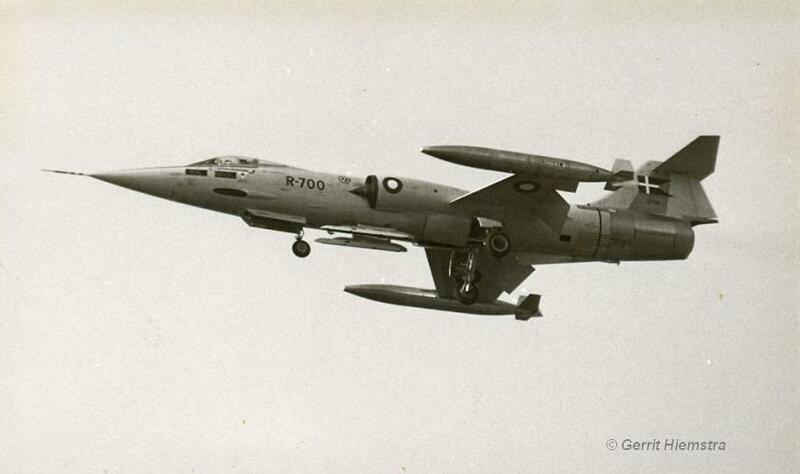 Four F-104G Starfighters and 3 Noratlas transport aircraft visited the UK later in May. Beneath a photo taken at Wethersfield showing the exchanging personnel. (JBG31 photo). Beneath also the Wethersfield newspaper article regarding the exchange, thanks to Helmut Baumann. 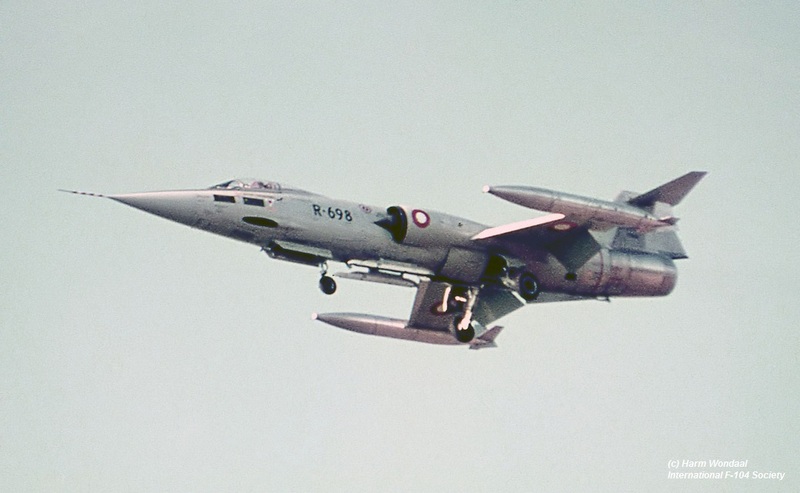 The first and only squadron exchange performed by the short lived 101 Gruppo (5 Aerobrigata) operating the RF-104G at Rimini, took place this month. 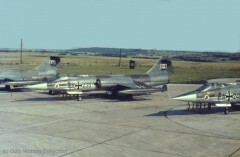 They exchanged with 10 TFS/50 TFW (USAFE) operating the F-100D at Hahn, Germany. It was a two way exchange. 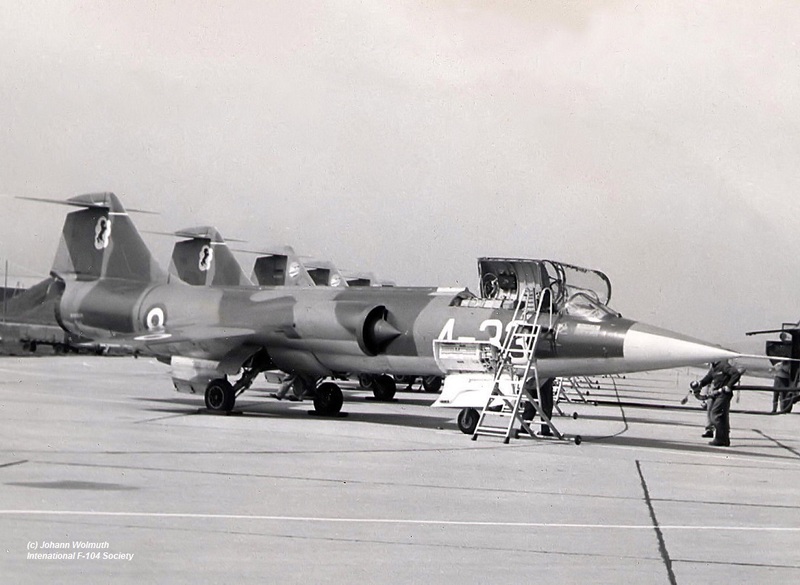 Seen at Hahn were RF-104G's: MM6636 code 5-26, MM6644 code 5-32 and unidentified MM with code 5-29. Beneath some photos captured from an interesing historic video taken by Anton Thiel at Hahn in 1966. One of the Staffels of The German Air Force AG51, based at Ingolstadt Manching exchanged this month with the Twenthe Starfighters from 306 recce Squadron. It was a very tragic exchange since on June 13th two of the visiting German Starfighters (8106 code EA+107 and 8160 code EA+248) collided over the Waddensee, West of Harlingen, Holland. Both pilots, Olt Manfred Hippel and Olt Dietmar Treppe were sadly killed in this accident. 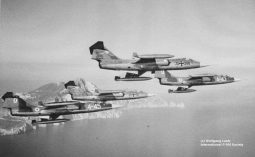 The Dutch squadron books show period 4 till 15 June 1966 while the AG51 squadron books show 7 till 16 June 1966 as the exchange period. 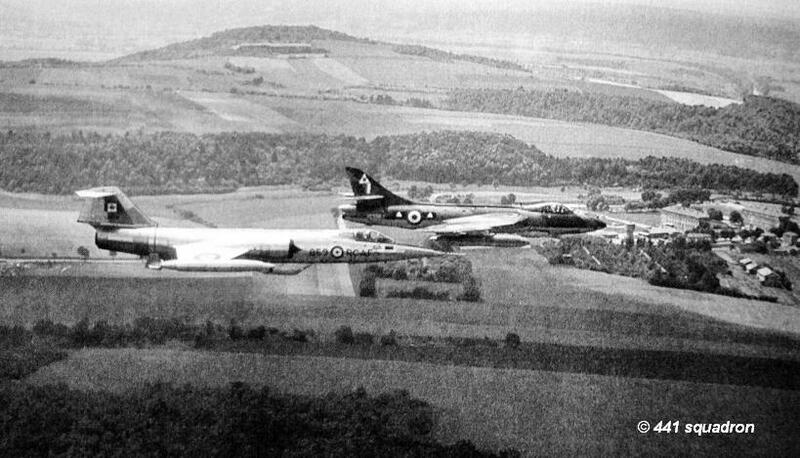 This month a shifted short squadron exchange was organized between German Air Force JG71 (1st Staffel) based at Wittmundhafen, flying the F-104G and the Royal Air Force 23 Squadron, based at Leuchars, flying the Lightning F.3 jets. First the Scottish squadron was flying at Wittmundhafen from 10 till 13 June, a week later some German Starfighter visited Leuchars in return. This month both Starfighter squadrons 21 Gruppo Autonomo from Cameri, Italy and 322 Squadron from Leeuwarden, Netherlands were involved in a 2-way exchange. 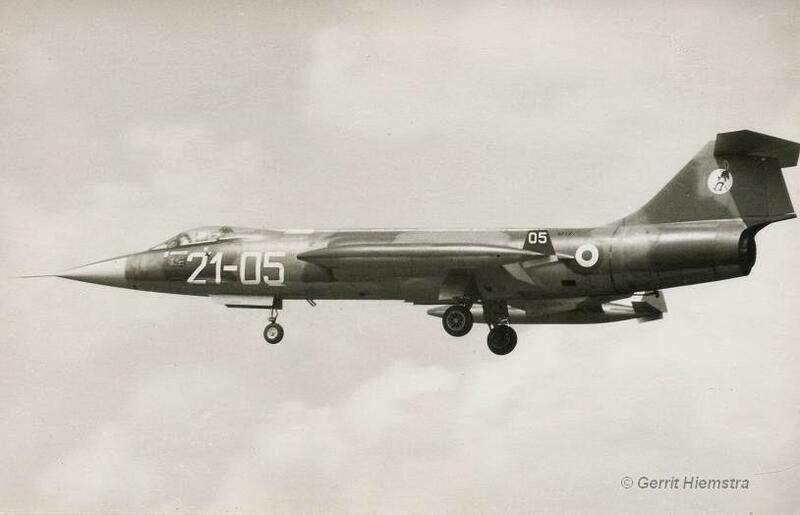 Aircraft seen in Holland were F-104Gs MM6543/21-02, MM6546/21-05, MM6557/21-16 and MM6575/21-09. Dutch Starfighters seen at Cameri were D-8093 and D-6654. 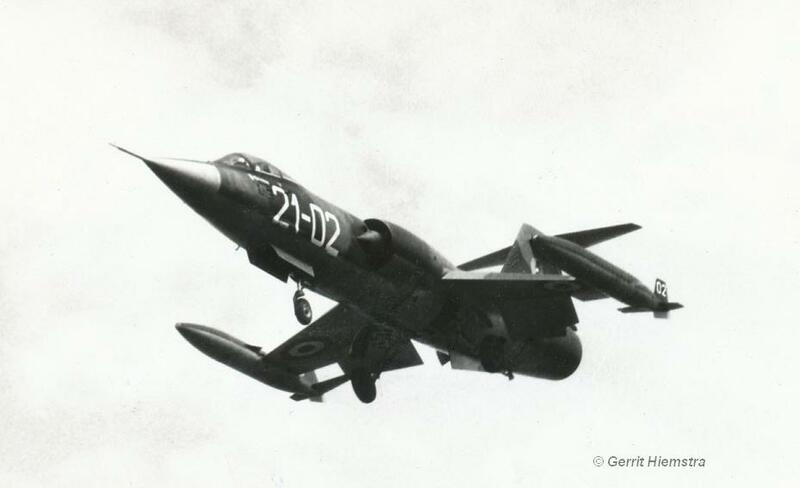 It was interesting to see that the Dutch Starfighters did not wear tiptanks but only underwing droptanks. Pure interceptor configuration!! Sadly the visit to Italy was a bit disappointing except regarding the environment. The Dutch pilots were only allowed to fly low-level cross country flights so they flew over the Po-area, near the Vesuvius and around Capri. Only the last few days the Italians gave approval for some Practical Interception missions. The photos beneath show (left to right) D-8093 over the Alps to Cameri (322 Squadron photo), MM6543 code 21-02, MM6546 code 21-05 and MM6575 code 21-09 (all landing photos by Gerrit Hiemstra). The photos taken at Cameri are thanks to (via) Jerry Stok, one of them showing D-6654. 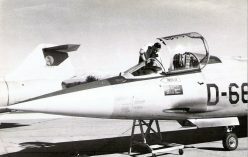 The German Air Force AG51 exchanged this summer with the Marville Canadian Starfighters from both Squadrons (439 and 441 Squadron). 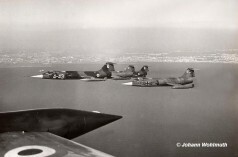 A number of AG51 aircraft (at least four) were seen in France wearing Canadian ZAPPS (including the Canadian Flag on the tail covering the German ones). One of the aircraft seen was EA+235 and very likely also EA+240 was seen. Left a nice air photo taken during the exchange at Marville. 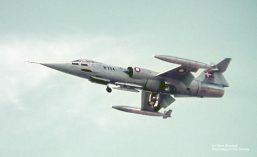 The AG Starfighters can be clearly seen due to their camouflage schemes. The other photo shows the flight line showing the German Starfighters zapped with Canadian flags. 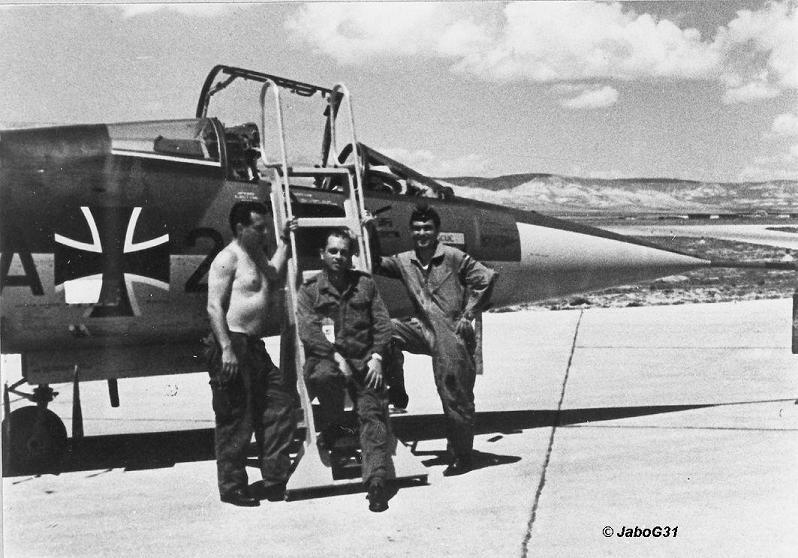 This month a squadron exchange toke place between the German JBG32 from Lechfeld AB and the Tanagra based Starfighters from the 114 Pteriga 335 Mira, Royal Hellenic Air Force. It is unknown if it was a 1 or 2-way exchange. This month the Italian 9 Gruppo (part of 4 Aerobrigata) from Grosseto, Italy exchanged with the Belgium Air Force 349 Squadron at Beauvechain. It is unknown if it was a 1 or 2 way exchange but at least the 349 Squadron Starfighters flew to Grosseto. 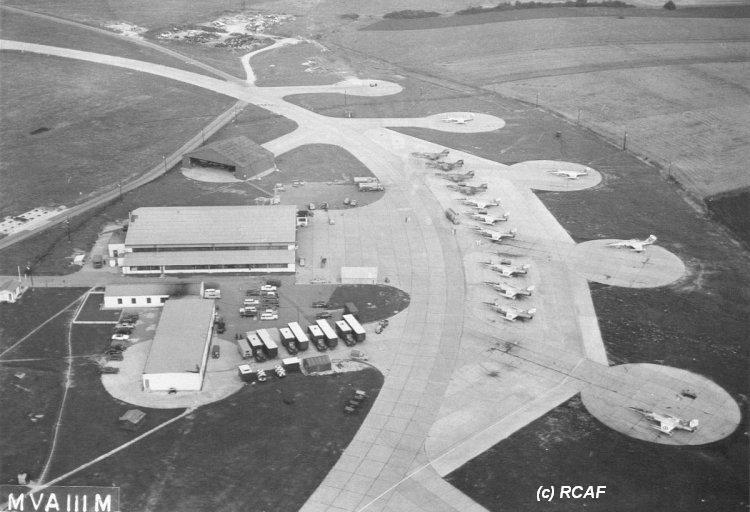 The Europe based Canadian Starfighters from 441 Squadron, based at Marville, flew to Great Britain for a squadron exchange with USAFE 1st TRS/10 TRW at RAF Alconbury flying the RF-4C Phantom. 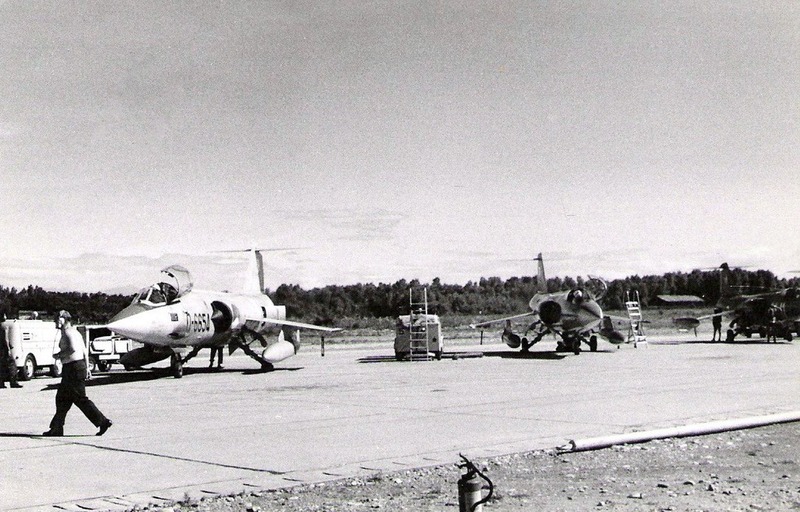 In total seven CF-104s participated and stayed for 2 weeks. This month the Belgium Air Force 23 Smaldeel, operating the F-104G Starfighter from Kleine Brogel, exchanged with Turkish Air Force Starfighters from Murted. It was a one way exchange, the Belgium Starfighters visited Turkey. At the time Murted was homebase of 141 and 144 Filo, both equipped with F-104G. 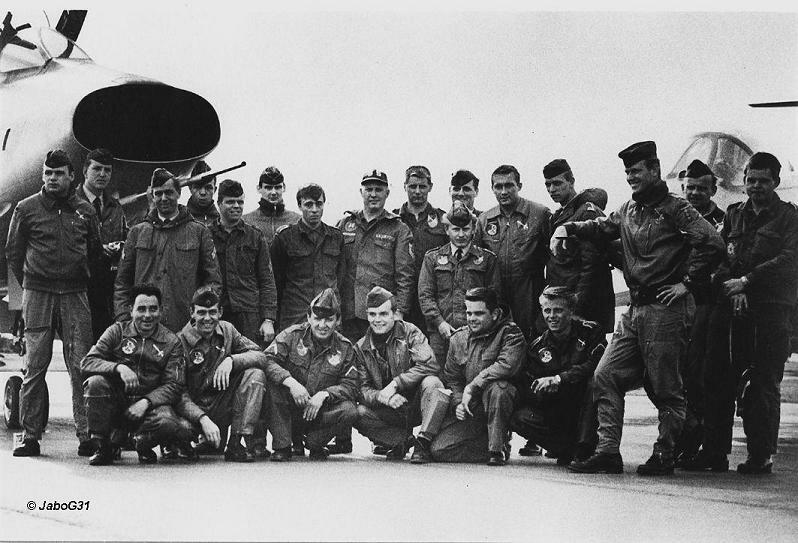 This period the Italian 10 Gruppo (part of 4 Aerobrigata) from Grazzanise, Italy exchanged with the German Air Force JG74 (1st Staffel) at Neuburg. 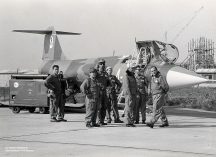 It was a two-way exchange where four Italian Starfighters flew to Neuburg, three of them being F-104G MM6514/4-33, MM6558/4-40 and MM6570/4-42. 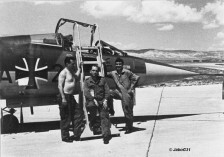 German Starfighters seen at Grazzanise included aircraft werknr 9081 serial JD+112 and werknr 8220 serial JD+246. Beneath a number of interesting photos all thanks to Johann Wohlmuth. 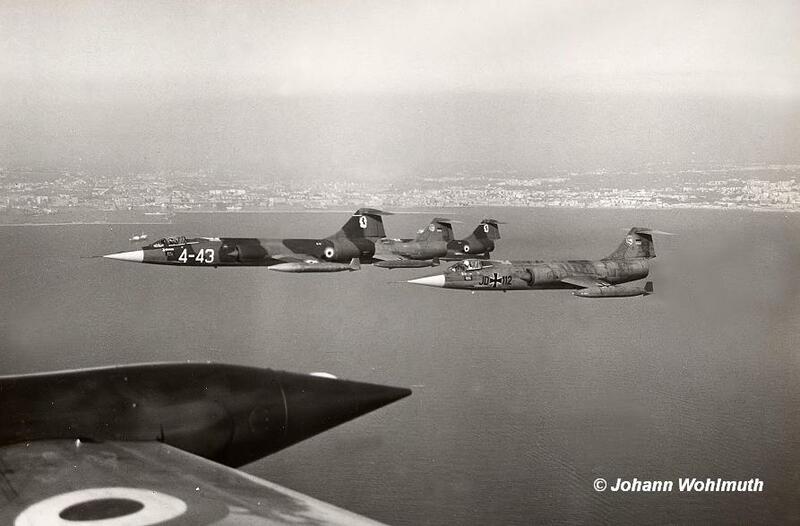 (1) Italian coastline showing a nice formation of two German and two Italian 104s. The JD+112 was one of the German aircraft operating from Grazzanise. 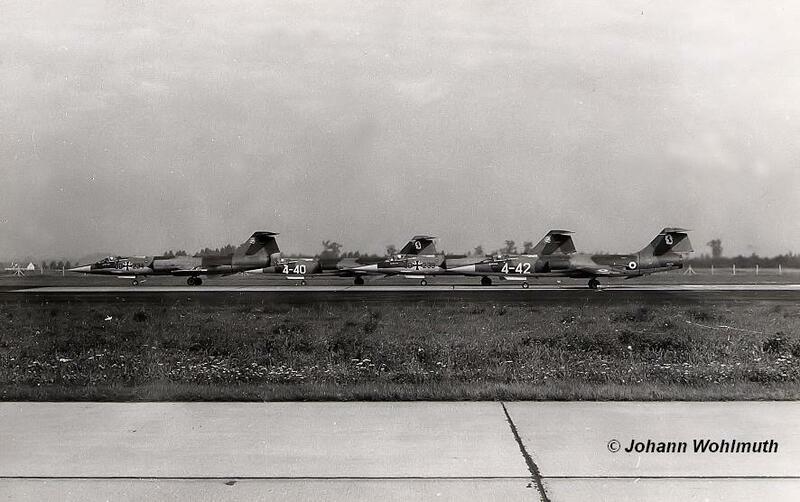 F-104G MM6571 coded 4-43 is leading the formation. 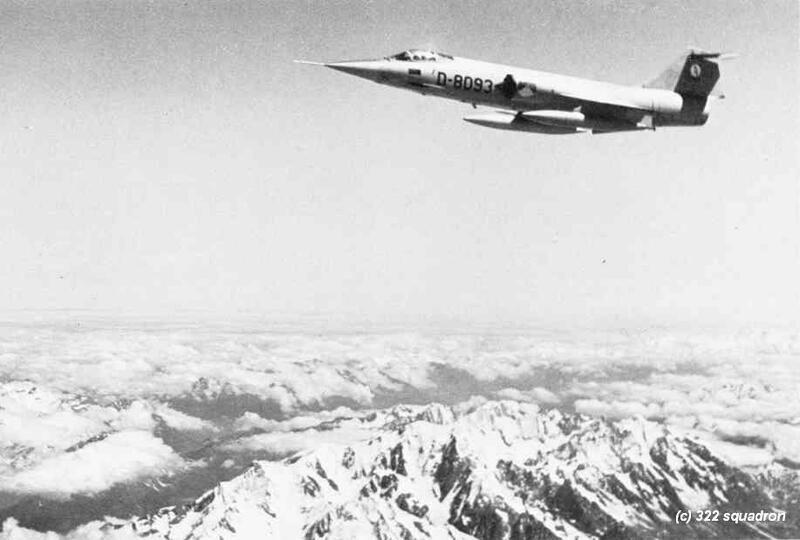 (2) Italian F-104G MM6570 coded 4-42 taking off from Neuburg with German JD+238. 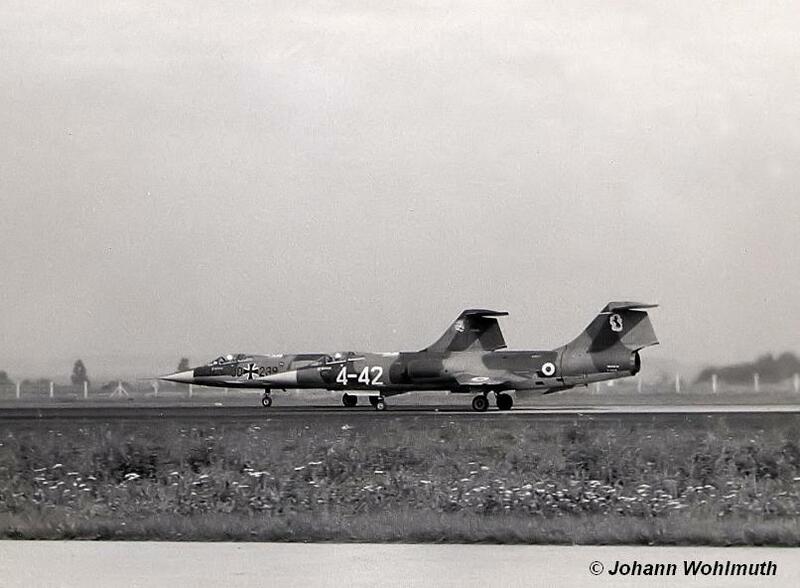 (3) F-104G MM6558 code 4-40 and MM6570 coded 4-42 taking off from Neuburg with German Starfighters JD+234 and JD+238. 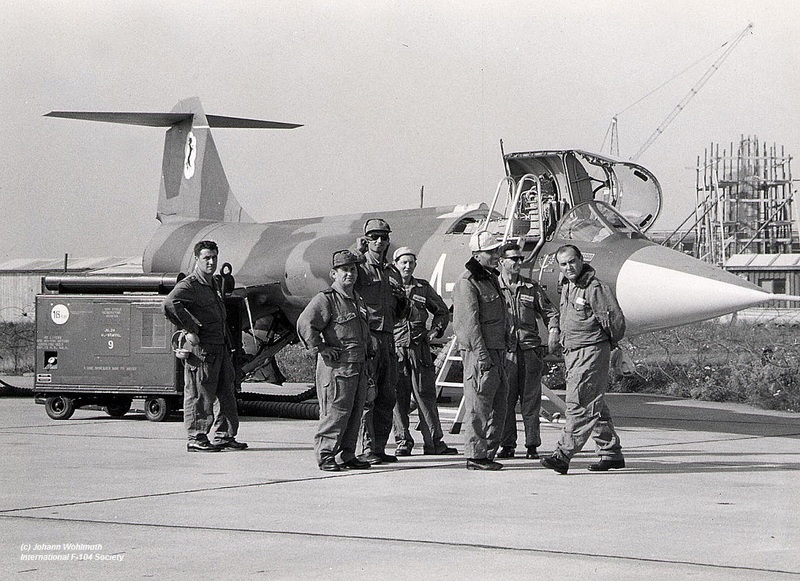 (4) Italian personnell in front of one of the Italian F-104Gs at Neuburg. (5) F-104G JD+112 and JD+246 flying in formation with Italian 104s 4-43 and 4-45, along the Italian coast during the exchange. 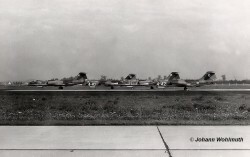 (6) Nice line-up at Neuburg, showing the participating Italian F-104Gs, starting with MM6514 code 4-33. This month both Starfighter squadrons 726 Eskadrille from Aalborg, Denmark and 323 Squadron from Leeuwarden, Netherlands were exchanging. It was a 2-way exchange. The Danish came to Leeuwarden with aircraft R-698, R-700, R-701 and R-754. Beneath photos taken by Gerrit Hiemstra (black and white) and Harm Wondaal (color) during the arrival of the Danish Starfighters on 12 September 1966. These show R-698, R-700, R-701 and R-754. 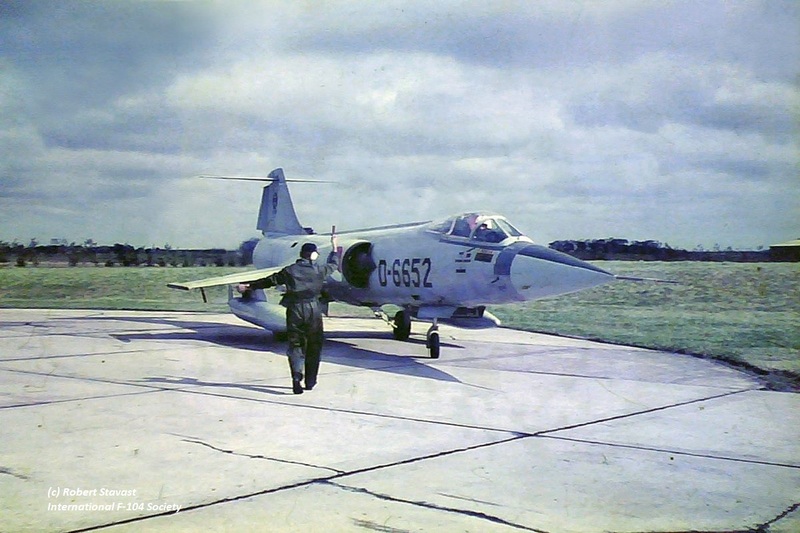 One of the Dutch Starfighters seen at Aalborg was D-6652 (see photo taken during the arrival by crewchief Robert Stavast) . A French Air Force Mirage IIIC squadron from Dijon exchanged with Starfighters from Beauvechain based 1 Wing – 350 Squadron. 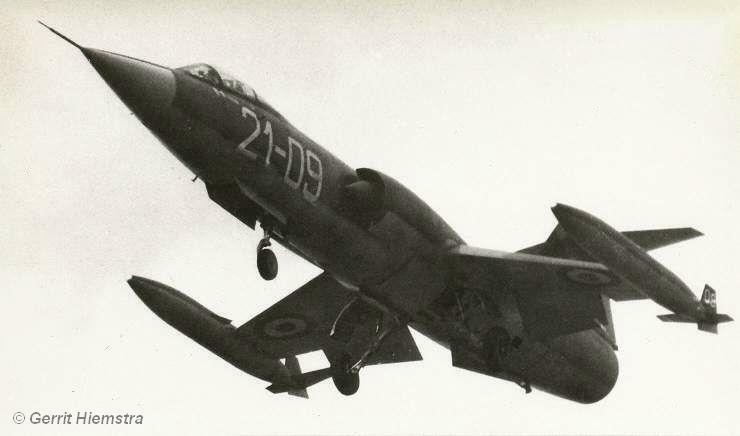 It is unknown if it was a two way exchange but at least the Belgium F-104s flew to France, one of them being an aircraft with a serial ending with a “9”. 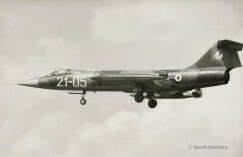 This period a shifted squadron exchange was organized between German Air Force JG71 (2nd Staffel) based at Wittmundshafen, flying the F-104G and the Royal Danish Air Force 723 Eskadrille, based at Aalborg, also flying the F-104. Only the Danish Starfighters flew to Germany. 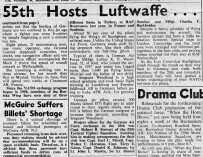 The Germans flew to Aalborg in return in 1967. 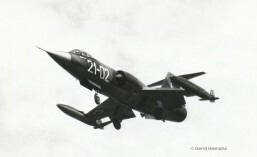 This month the Belgium Air Force 23 Smaldeel, operating the F-104G Starfighter from Kleine Brogel, exchanged with the French Air Force Mirage IIIE aircraft from 13 EC, operated from Colmar. It was a one way exchange, the Mirages visited Kleine Brogel only. The Canadian 422 Squadron (4 Wing), flying the CF-104 Starfighters from Baden-Sollingen had a squadron exchange with the Belgian Air Force 10 Wing flying the F-104G from Kleine Brogel. It was a 2 way exchange. 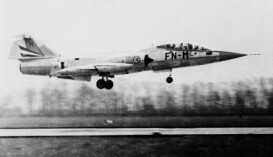 Four Belgium aircraft flew to Sollingen and among more aircraft (at least 3 pilots from 422 Squadron participated) two Canadian Starfighters were identified at Kleine Brogel being CF-104 12848 and CF-104D 12665. (Information thanks to Valentin Kenens). 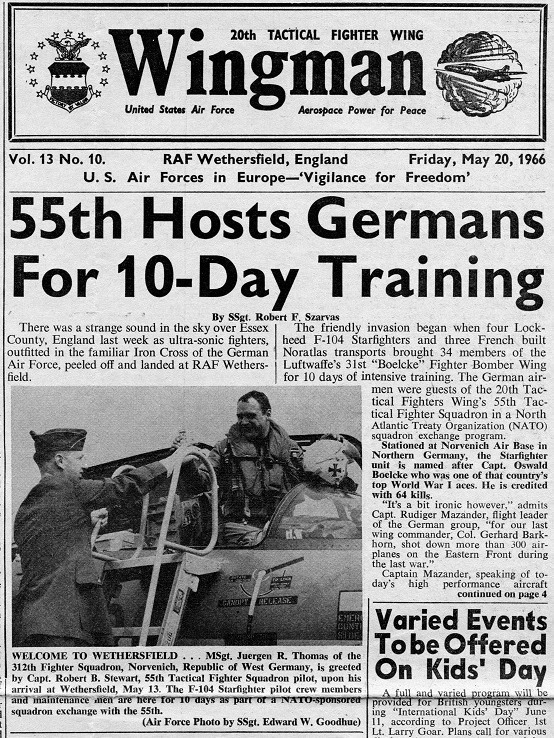 This month 311 Squadron from Volkel, Netherlands exchanged with one of the squadrons within 3 Wing at Zweibrucken (427, 430 or 434 Squadron). It was a two-way exchange. 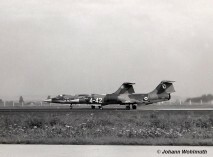 Aircraft seen at Volkel on November 10th were CF-104s 12759, 12801 and 12826. 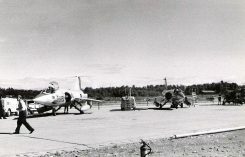 A pre-visit took place on 28 September by visiting CF-104 12812 and CF-104D 12654. 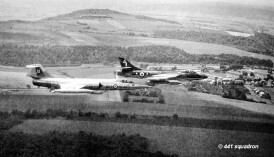 (Some believe it was 430 Squadron but this is not confirmed). 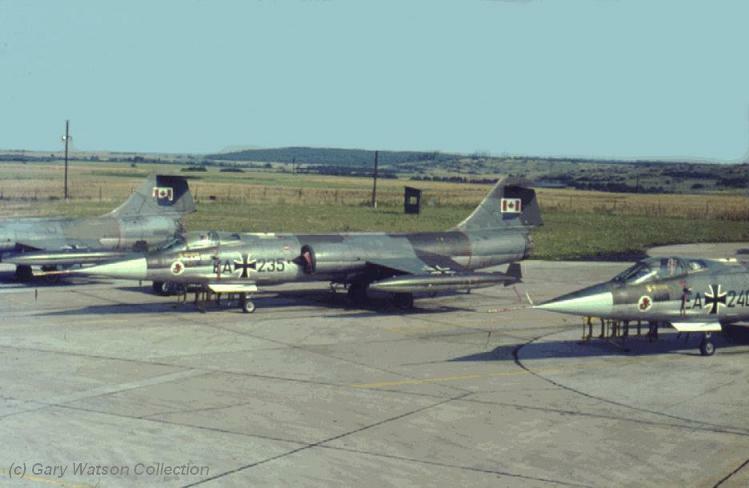 This period a squadron exchange was organized between German Air Force AG52 (1st Staffel) based at Leck with the Laon based USAFE 66th TRW (exact TRS involved unknown), equipped with RF-101C. 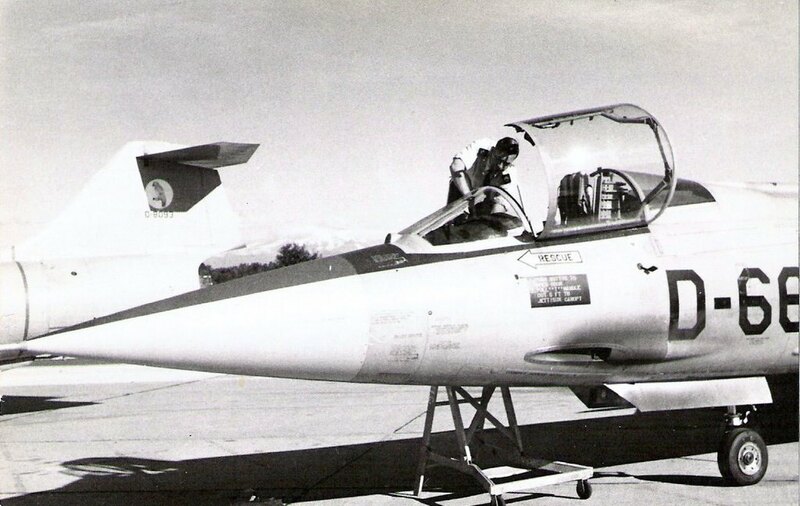 During this period the AG52 flew a mix of RF-84F and RF-104G aircraft. It is unknown which of these 2 types participated.